4k miles. Just serviced. New Tires. (this bike cannot be registered in CALIFORNIA) NOT CA LEGAL. Must be registered out of state. Fuel-injected 599cc race level sport-bike. Aluminum twin-spar frame, Showa front and rear suspension, wet slipper clutch, and stainless exhaust all contribute to the epic handling and extreme power to weight ratio. Expect instant throttle, turn-in and braking performance thanks to the track heritage of the GSXR. 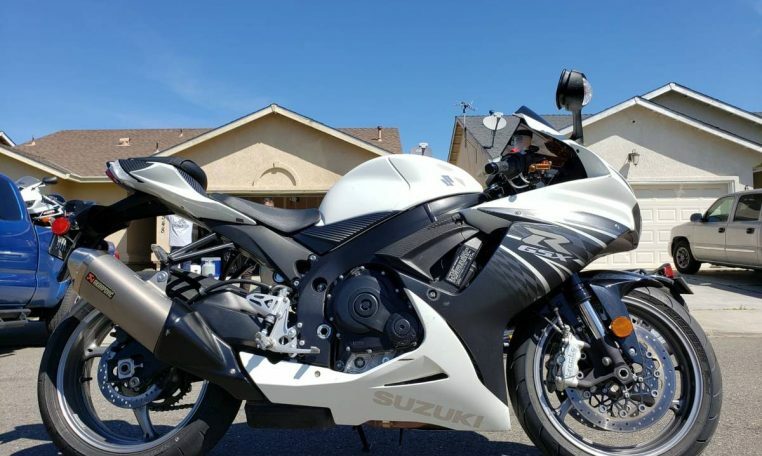 Nearly all modern super-sport bikes have impressive engine and handling performance, and the GSXR is no exception. Although the 600 does take many styling cues from its big brother, the GSXR 1000, the 600 takes on a more compact form, featuring a smaller fuel tank, narrower tail, and a stacked gearbox to further conserve space. All of this contributes to the claimed dry weight of just 161 kg. Aerodynamics have improved by five percent thanks to sleeker body panels, and the bike is finished with thin three-spoke wheels. The GSXR 600 has some of the best ergonomics of any sport bike thanks to a plush seat, comfortable handlebar position and ride height. In addition, gearing is tall to improve the GSXR’s function as a street bike to compliment its track-day performance.